Last week we finished our short Bible study series on Christmas and this Wednesday night we will have our Youth Christmas party during our normal meeting time! We hope that you're able to join us as we fellowship together, have fun, and eat pizza and snacks. On Wednesday evening, the Family Life Center will open at 6:00 for hanging out and the party will start at 6:30, wrapping up at 7:30. Join us and invite family and friends! Next Wednesday night, the church will not be having our Wednesday night services. We hope that you spend that day with family and friends in fellowship and worship! Email me at jason@homelandparkbc.org if you have any questions! This Wednesday night, we will finish our short study series on Christmas. The Family Life Center opens at 6:00 for anyone wanting to hang out. Bible study begins at 6:30 and we wrap up at 7:30. We would love for you to join us and to invite family and friends! Next Wednesday night, we will have our youth Christmas party in the Family Life Center during our Bible study time. Come join us for food and fun as we celebrate Christmas and the end of our first fall together! Finally, we will not have our regular youth Bible study on Wednesday, December 25. Enjoy that Christmas Day with your family! This Wednesday night, we will be continuing our weekly Bible study as we do a two week series on Christmas. This will be a fantastic opportunity for fellowship, fun, and growth as we will be discussing the meaning and our celebration of Christmas. The Family Life Center will open at 6:00 and we will begin our study at 6:30 and last until 7:30. On Wednesday, December 18, we will have a youth Christmas party in place of our usual Bible study. More details will be coming about this soon. If you have any questions about any upcoming events, please email me at jason@homeland parkbc.org! God blessed our church and youth ministry greatly on the ENGAGE Retreat. Thank you to everyone who made this weekend a joyous occasion for us. Your prayers, support, and financial sacrifice went a long way in providing a great opportunity for our students to spend a weekend in fellowship with other students as they sought to grow closer to God. The ENGAGE Retreat was a partnership of Homeland Park Baptist Church, Varennes Heights Baptist Church, Southside Baptist Church, and Andersonville Baptist Church. The intent of the retreat weekend was to teach and challenge our students how to engage with God, other believers, and non-believers. This was done through worship rally gatherings, personal Bible studies, specialized small groups, and fun activities while hanging out. 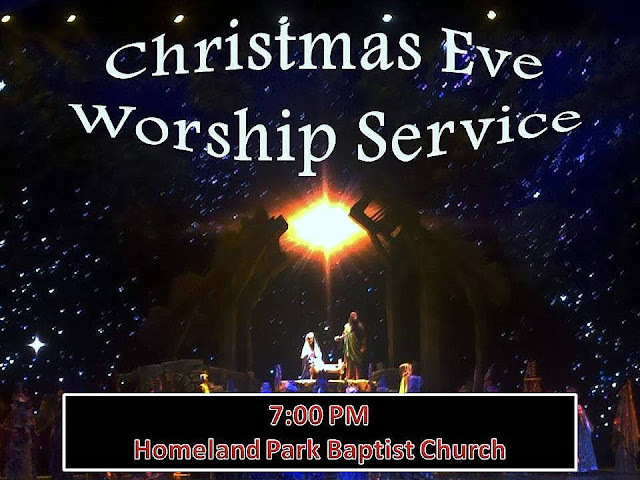 We are excited to invite you and your entire family to our Christmas Eve Worship at Homeland Park Baptist Church. We will gather in the sanctuary at 7:00 pm for a brief time of worship and celebration of the most beautiful gift ever given, the birth of our Savior Jesus Christ. 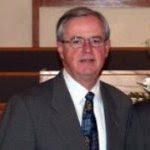 Pastor James will also have a children’s message for all who attend. Dress for this service is “Christmas Casual” so bring your family to worship with your Homeland Park family. We hope to see you here. What a strange way to save a world! God's son coming to this earth to live a humble, yet sinless life so that we could miss hell and gain heaven. Jesus' castle was a cold dark cave. His throne was a manger and his first witnesses were His earthly parents and a few barnyard animals. How could this baby be the king of Glory? Why would Jesus leave His heavenly Kingdom for our earthly one? Why would God let His one and only son die on a rugged wooden cross to atone for our sins? What have we done to merit such a gift?